The fast-moving Valley Fire that started burning in Lake County yesterday has exploded to 50,000 acres, destroyed several hundred up to 1,000 homes, and forced 17,000 people to evacuate. LAKE COUNTY, Calif. (KGO) -- Cal Fire officials are investigating a reported fatality in the massive Valley Fire. The fast-moving fire started burning in Lake County Saturday and has exploded to 50,000 acres, destroyed several hundred up to 1,000 homes, and forced 17,000 people to evacuate. At least 6,400 houses are being threatened. A Cal Fire spokesperson called it unpredictable, saying it grew to more than 40,000 acres in just 12 hours. PG&E officials say at least 5,800 customers are without power. Many of those customers are under mandatory evacuation orders. The wind is spreading the fire toward Napa County and into the Geysers area. Cal Fire says there is damage to some of the cooling towers and power plants there. No homes in Sonoma County are threatened right now. Governor Jerry Brown will join Cal Fire officials Monday at a press conference following a private briefing. Crews are setting back fires along Highway 29 to starve the approaching fire of any fuel. At a news conference Sunday, the CHP said it will be two to three days before people can get back into the burned areas. Officials say at least 27 people have been treated at hospitals in Lake and Sonoma counties. Twenty were treated St. Helena Hospital in Clearlake and seven were treated at St. Helena Hospital in Napa Valley. Most of those injuries were for smoke inhalation and classified as minor. Four firefighters were burned, but all are expected to recover. The cause of the fire is still under investigation. County officials say people are scamming survivors through social media by asking evacuees' for their addresses. According to county officials, the scammers say they are part of a news crew covering the fire and will check on the evacuee's home. But officials say it's just a ploy burglars are using to steal things. Sheriff's deputies are patrolling evacuated areas and advising evacuees to avoid giving out their addresses online. Many evacuees are worried about their pets and animals that were left behind. A Facebook page has been created to help reunite those residents with their animals. The devastation in Middletown is simply unbelievable and now the neighborhoods are unrecognizable. 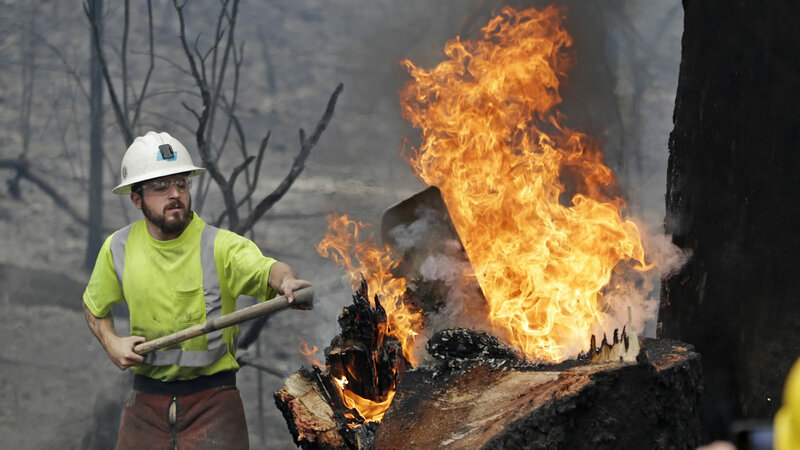 Dozens of homes were destroyed by the monster Valley Fire that tore through the area on Saturday night, burning neighborhoods on both sides of Highway 29. Cars melted down to scrap and chimneys are the only things left standing. Officials say there is no water or power in Middletown at this time and it's unclear when it will be restored. Crews were able to save many homes in the area, but they say it wasn't easy. The wall of flames was so ferocious there simply wasn't time. ABC7 News spoke with residents who lost their homes. Kimberly Harper not only lost her home, and the homes her two sons were renting also burned. "You know, I grabbed a few things, I grabbed a couple of photo albums," she said. "And you think you're going to be prepared, and you're not. I grabbed a handful of clothes for my husband, for me. We got our dog. We couldn't get our cat because she ran and hid. And so, just some photo albums and everything else is gone. My kids grabbed clothes. They lost everything they own. They're renters, so they don't have any homeowners insurance or anything. I'm more worried about them right now, I think, than us." Most of downtown Middletown survived the fire just fine, along with local schools. Twin Pines Casino is also still standing but closed this weekend. Drivers will face delays and detours because of the fire. The CHP has closed northbound Highway 29 to 175 in Kelseyville and Highway 29 through Lower Lake. Hundreds of people have been streaming into the evacuation center at the Napa Valley Fairgrounds since Saturday night. And so have donations. It is full of people who say they barely escaped with their lives. Everywhere you turn people are sharing their stories, expressing how they are still in shock, and wondering if their homes are still there. As fast as the fire struck, the Napa County Fairgrounds in Calistoga turned into a refugee camp overnight. The Red Cross says between 500 and 1,000 evacuees are camped out there with more still streaming in. Right now it's somewhat of a chaotic collaboration between the understaffed Red Cross and hundreds of community members bringing in supplies. ABC7 News saw people bring in fresh produce from their gardens, bringing in diapers bought at the store, and shipping any pallets of water. The Red Cross says thank you, however, says it no longer needs supplies. It is now asking for cash donations only so it can get exactly what the evacuees need. Mandatory evacuations have been called for Point Lakeview Hwy and Hwy 281, Rivera West and Clearlake Rivera, Hwy 29 (Kelseyville) at Hwy 175 south on Hwy 175 towards Cobb, Red Hills Road to Hwy 29, Hwy 29 X Hwy 175 south to Seigler Canyon Road (south side of Hwy 29), Hwy 29 Tubbs Lane (Calistoga, Napa County) to Hwy 29/Hwy 53(Lower Lake, Lake County) Butts Canyon Road to Napa County Line, including Berreyssa Estates, Butts Canyon Road to Pope Valley. Communities of Cobb, Seigler Canyon, Loch Lomond, Middletown and Hidden Valley Lakes, Livermore Road, Summit Lake Road and north of the community of Angwin. An advisory evacuation is in effect for Pine Flat Road 5000 and above, Geysers Road out of Healdsburg 6000 block and above and Geysers Road out of Geyserville 9400 block and above.